What is project nodenoggin ? In a recent inkubator podcast I talked to Doug Belshaw. In this episode he tried to help me unpack the question “What is project nodenoggin?” We recorded the episode shortly after I made the project code public and his series of questions and the discussion really helped me think about a few specific points. One neat question he posed was if you could describe the project with current products what would they be? A great question as it allows you to situate your own concept quickly and helps overcome the hurdle of the unknown. People would then agree this would be a positive move. However it’s actually a bad answer for a number of reasons, mainly because it’s not useful as it gives completely the wrong picture. In fact it goes against the ethos of my project. True, the project nodenoggin is a digital tool to support teaching and learning. But that’s the only connection to a product like Blackboard, so any of the other thoughts one might have about Blackboard will potentially ruin, in your mind at least, what the project is. My project argues why the Learning Management System (LMS) is and probably has always been outdated. A key point is that the paradigm used by current tools we use is wrong and we need something else – a different paradigm. Ok so that’s an very awesome, fantastically illustrated, neat summary of some of the topics I am trying to tackle and they are certainly doing some good work. So now you have some clues as to why we need new types of tools. 2. So lets get back to the main question, what is project nodenoggin? Ulysses + Deckset + Ember + Milanote + a Community of practice. What!!! That doesn’t help!! I hear you cry. Fair point, so here is a little more of an explanation. Ulysses is a Markdown 3 editor with a great user interface (UI) and great looking previews of said markdown text. All your sheets are stored in groups on the left pane and can be connected together to structure longer writing. The main UI in the middle is the markdown editor itself. The far right pane lets you add attachments, notes and meta data such as word count targets to each sheet to support your writing. You can also quickly share (save) the sheet in a rendered view, which makes it look nice. This output can be done in a variety of ways very quickly. Its a pretty complex app but the core aspect is you can take plain text4 and you can render the content to look great in a variety of outputs (which can be customised). 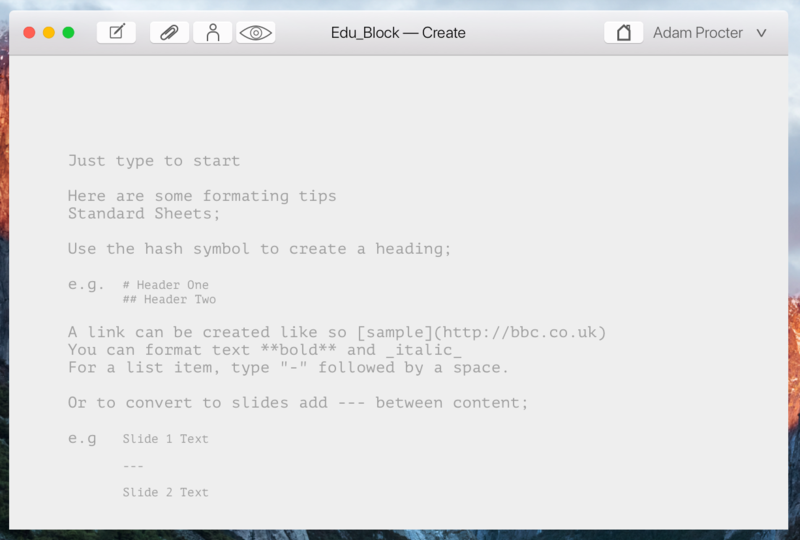 Deckset uses a Markdown file to create and present slide decks. Using again a plaintext document with markdown syntax Deckset creates wonderful looking slides from templates (which can be customised) and has a fully fledged presenter mode. Think same formatting as within the main Ulysses UI (markdown) but with the output being slides and a presenter mode not documents. Ember was a macOS app (Littlesnapper 2 effectively) for quickly collecting and organising images and visuals for any project. It was pitched as a digital scrap book it was intuitive and very friendly to use, it included a built in RSS reader for connecting and viewing feeds of visual inspiration. You could add your own annotations and quickly snap (import) and share (export). It worked really well but unfortunately was sunset a number of years ago. Consequently I have included the original YouTube trailer to give you an idea of the app. I do have the application somewhere on an older Mac but haven’t dare launch it in a while. Milanote is a tool where you can start to arrange and organise objects into a spatial arrangement and make connections between those objects. I would define this for now as a spatial hypertext tool. There are a few other similar tools such as Tinderbox from Eastgate that do similar things, but Milanote seems to one of the more delightful looking approaches. The final piece of the puzzle is not another app but the concept of a community of practice. So aspects from each of these will inform project nodenoggin. Ultimately nodenoggin will be a spatial knowledge building collaborative digital tool that points towards a new category of tools that augment learning for a community of practice, specifically design practice. It will be free (as in libre), human, humane, delightful, intuitive, shared, decentralised, digitally native and an extension to physical shared knowledge working design thinking practice! Well that’s the answer for now. I hope it’s helpful or at least provokes some thoughts and reactions. If you find it interesting, debate on my discourse, contribute the code at my gitlab and chat with me via micro.blog. In a follow up post I will outline how I envision workflows within this tool. This blog post outlines some detail on the tools I am now using to build my prototypes, including why I am using them, and concludes with a recent app example combining Snap.svg and Vue.js to connect data in real time with deepstreamHub. The choice for using Scalable Vector Graphics (SVG) and Snap.svg is very simple, it’s to support the visualisation of the data. In my instance, this data is learning objects. (documents, links, slides etc.) The aim is to take this data into artifacts that can then be manipulated via a spatial interface. Move, connect and combine. SVG allows the concept I have of relationships, distances and zoomability that I want to experiment with. The SVG format by default ensures device indifference and thus scalability and visibility options on small, large and mobile screens are easier to accommodate. Mobile screens are everywhere alongside large format screens and projection within our teaching studios. The accessibility and usability of any tool has to be built into its defaults. Choosing good defaults is a major design consideration that I will be working hard to get right, such as by default accessible and responsive. Vue.js was found after a series of conversations and previous considerations around my choices for the programming language I wished to settle on. I initially starting my investigations with Go (golang) and then moved to Swift before ending up with Vue.js. I initially looked at Go (this blog is running on Go in fact) because the details I understood about the way the programming language was designed and the integration of front end and server side technology sounded great. It was also a web focussed technology and my thoughts have always focussed on the web due to its open standards and ethos. However, Google created Go and this certainly contradicts the ethical ethos the project will take on data, which I felt was problematic. Go also didn’t really progress where I had hoped in terms of front end abilities. Then finally after attending a UK golang conference, I found I was so confused with the details in part I think due to the fact Go was much further into Computer Science and large scale application design than I am or was prepared to deal with. Another choice that started to emerge at a similar time was Swift. Again the background to the language was exciting. Another decision in this project is to be design-led and thus adhere to design principles within the manifesto. Principles such as those you can associate with the design ethos at Apple. Apple created Swift for its own development purposes and could perhaps thus help support this aim. Apple have good, detailed Human Interface Guidelines and make a number of design affordances I certainly consider as best practice. So much like with Go I played and built a few Swift prototypes both for macOS and iOS which in fact went very well. I also invested in the latest Paintcode app which can take UI elements directly into the latest Swift Code using a Sketch app like interface. However, Swift was not without a number of concerns. Although Swift was made open source, the platform for deployment iOS and macOS is not open. At some point, I had convinced myself that the implementation of my tool on macOS and iOS would work as an exemplar of my manifesto. And I felt that as my exemplar used a design-led platform, iOS and macOS, others could just follow this lead and read the manifesto for conversion to other platforms. However another major issue arose in our studios, the fact that many students I would work with to test my tool use Windows and Android in general. So, my ability to test my tool, my exemplar, in the live education studio would be very limited if built in Swift. This was a bad decision: the project is human centred and making my tool much more intuitive and delightful but not being able to robustly test choices in depth would in the end hamper my design decisions. The final nail in the Swift coffin was the rejection 1 from the App Store of my Swift App “SaveIT”. This was a clear indication that the gate keeper of the App Store, Apple, may have future issues with my design choices and may not leave me free to dictate “delightful” design choices, another area my research is focussed on investigating and defining. This further cemented the fact I hadn’t reconciled my desire for an open project and open platform and so the web came calling back. I know and have much more experience on web tech and coding than I do in “real programming”. And alongside a host of websites, web based tools I have made numerous web “apps”. Why had I not stayed on this course! To be brutally honest I was totally confused and got nowhere fast. Using Angular and React seemed a much higher barrier to entry than Swift or even Go had been. Yet in this futile attempt and scouting exercise I in fact stumbled into Vue.js and as an aside (for now) Electron. Vue.js was so quick to understand and the more I read reviews and discussed it the more excited I became. 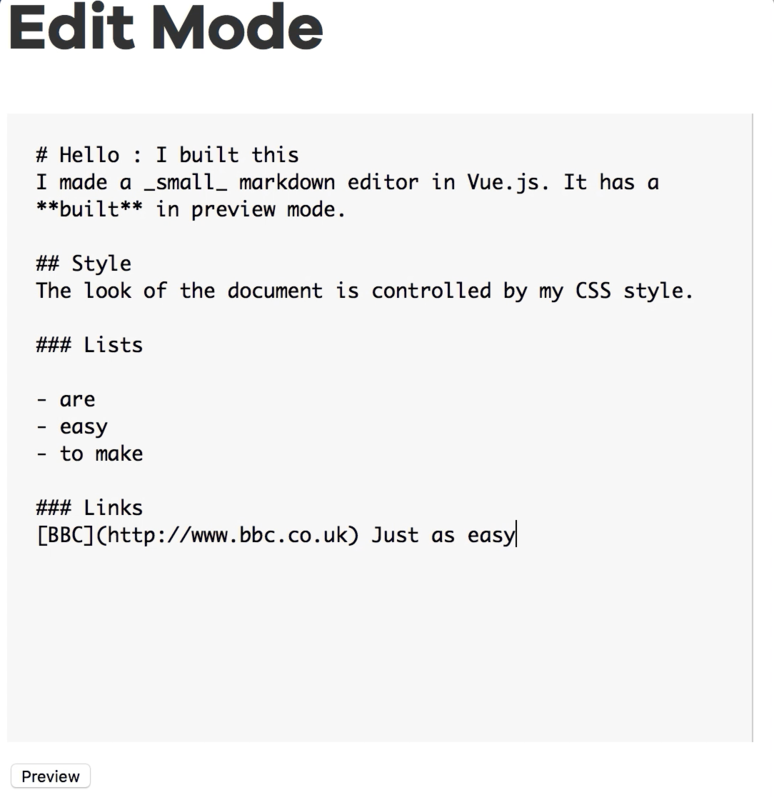 My previous blog post which showed a markdown editor I built from a Vue.js example was so fast to get up and running and tweakable I was pleasantly surprised. This also revealed to me that the data could be formatted towards JSON. This is major. If my tool is to be decentralised again dictated by my manifesto I needed a highly portable, lightweight data structure. 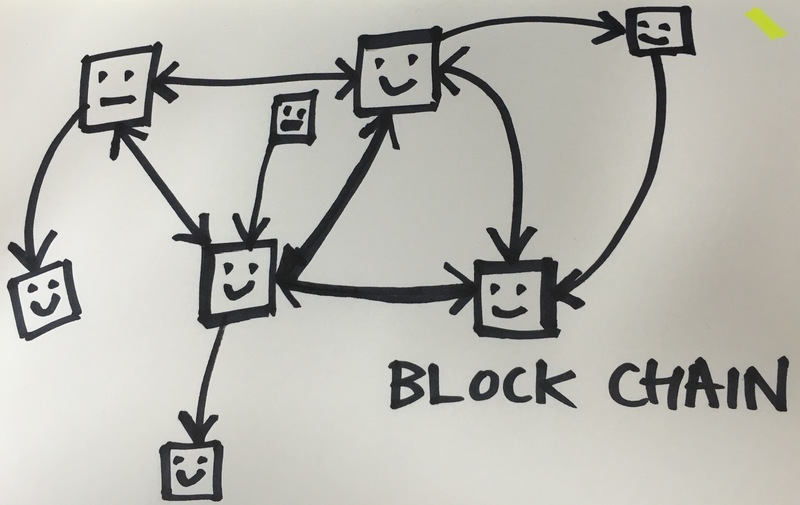 My previous considerations of local sync with MYSQL via blockchain style methods such as Syncthing or Etherium disappeared as a concern. This is a complicated technology and with Swift I had even considered to just not implement the blockchain part of my exemplar hoping someone might fill that gap as time went on, another poor choice. Go had at least offered flat data files as a nice light weight option and I did get 3 party sync working with IPFS but it was far from easy. Vue.js just started to make total sense. A number of things lined up and so then I looked at how I could network the JSON style data from Vue.js across devices, which is when I located deepstreamHub. This sounded good. The data was also in JSON and there was another great tutorial on Vue.js showing how to connect to deepstreamHub. I hooked up my Vue.js app to the deepstreamHub and was able again quickly to take my previous single device markdown prototype and store and sync the data with deepstreamHub across multiple devices! deepstream is an open source server inspired by concepts behind financial trading technology. Although I was testing on the deepstreamHub cloud and it just worked, knowing that deepstream itself was also open source and could run on a standard web server added to the excitement. I know I need to experiment with a spatial interface. My research into spatial hypertext and other conversations, at places like The Future of Text conference, have solidified this. With the initial simple demo up and running it became obvious that I should be able to take position data from objects and store this as JSON in real time with Vue.js and deepstreamHub. So this brings us right back to SVG and Snap.svg as I was able to use this with Vue.js to create an artefact that I could drag around.2. I could then take the position data of this SVG object into deepstreamHub. But not only the position for the artefact it could contain the owner, the title, the actual markdown text of the artefact and in fact any associated connections, relationships or tags that could be needed to make this a truly networkable learning object. I could even add data to the object after if there was a need to add in additional functions. I am pretty excited about getting to where I am with a practical demo this quickly around some of my initial ideas. However, I did get a little stuck in the final pieces of the data puzzle and may need to rethink exactly how best to store and real time sync the data but I have the tools that I believe will offer the answer, so long as my skills can match up to the challenge. The good news is that so far, that seems to be the case! Please join the conversation about this below and feel free to examine all my code here. A lot of the thinking work I undertake for all of this is recorded as scribbles in OneNote and via conversations with others. Here are some of the more recent scribbles to give you a little sneak peek into this part of the process. SaveIT is a very simple app designed to allow you to really quickly capture thoughts. The app uses iOS and Mac OS Reminders as the default store to capture your ideas and then you can do what you like with them. The rejection email asked for a new app concept. I replied to justify my design choices. Please can you reconsider my app. The app is minimal yes however this is a major design decision. The concept is based on the experience of when ideas come to mind or you are prompted with something you need to do later. I want and I believe others do need a distraction free way to get this thought / to do into a reliable system that you can process later. This concept is based on the “Get Things Done” principle to get these things out of your head and into a system. The Reminders app on iOS and Mac does provide a similar function. However there are two distractions. Instantly one is the list of other things you have in the system. This cognitively shouldn’t be under estimated, and may distract the thought you are having and the same action in Reminders versus Save It is 3 steps not 1. There is an app Later within the store that provides a similar ethos however it uses a proprietary storage system where as I felt that using the iCloud eco system made much more sense. So I would also argue that their app provides less functionality as it requires a 3rd party subscription. I could not have made this as a web app to connect to the iCloud calendar store. The interface is designed to be unobtrusive and provide the user with a moment of delight through simplification. This was met with a shorter rejection. Below is an image from my Marvel prototype I was playing with at the end of last academic term followed by a very early prototype built this past week in vue.js around the markdown entry system my app will need. This is an abstract for a yet to be completed PhD which will be used to set and keep the focus of my research. This is a live document and will obviously change. I have also not included comments on the outcomes of the PhD as I do not know what these will be. I am confident it will not be a new off the shelf Blackboard or Moodle (MLE) however it will be a series of experiments and reports that culminate in systems and a manifesto ~1~, whether this be dropbox, seeing spaces (Victor, 2014) or something else. The following conceptual abstract is designed to help inform my research and obviously hints at chapters that would outline the details of some of the statements I am making here. As such there are more references and concepts that I have not included at this stage as they will form the broader actual research and wouldn’t add value to this post at this stage. Comments are however very much welcome on points of research and practitioners that you think could inform chapters or experiments within this PhD, even if I am already looking at them, it does not matter. New Ed-tech tools are being created almost daily however this is often driven by marketing, business or technology. There is a dearth of experience and design-led systems. Blackboard and other such Managed Learning Environments (MLE) promise to enhance education and yet there is very little evidence that this is in fact the case. These outdated yet digital filing systems replicate paper originated practice and although some supplement teaching and allow for additional tasks such as lecture capture, wiki’s, blogs and quizzes they do little to embrace the medium they reside on. It is also worth noting that within Higher Education Ed-tech appears to have been driven by agendas that had little to do with enhancing education. This imposition often reflects what amounts to a thoughtless approach to teaching and learning, in which pedagogy is side-lined by neo-liberal practices of efficiency and surveillance. (Hannon and Bretag, 2010; Holley et al., 2011). The following PhD outlines a new approach to the MLE. This document provide methods to approach the needs of an institutional level art & design learning environment that extends well beyond traditional classroom learning and is far removed from the file and folder systems we currently endure. The Practice based PhD utilises case studies, an open source repository of materials, working prototypes and a manifesto that indicate new design approaches to run, adapt and create new hybrid learning platforms to foster new and innovative thinking specifically within the field of art & design higher education. This PhD sets forth it’s manifesto and guidance via thorough testing, iteration and design thinking to create a new dynamic medium that truly enhances learning within UK Art & Design Higher Education. By taking a new approach to software as a service and creating a dynamic medium that encourages new representations, via contextual learning, adaptive and dynamic learning this PhD challenges the current conventions of an Ed-tech system. Today many academics in humanities and social sciences still need to grasp this simple but fundamental idea. They continue to think of software as being strictly the domain of the Academic Computing Department in their universities — something which is only there to help them become more efficient, as opposed to the medium where human intellectual creativity now dwells. (Manovich, 2013). Learners –– both students and professors alike — will be able to take this transparent and open system and create and connect to an edu-network with privacy, knowledge acquisition and networked learning at the core. A corner stone to this new way of thinking is to understand that the web has become centralised and that the web is now based on a database culture. Services such as Facebook dress themselves up as networked culture but are in fact databased culture (Gupta, 2015), with the sole purpose to data-mine information for profit. To create decentralised systems that are capable of serving large and small scale art & design learning, these prototypes utilise blockchain and P2P technology. Learners own their material and share this material in a distributed, secure, private and personally owned system, and all rights are controlled by the contributors. This new networked and decentralised system encourages proximal development, Vygotsky (1978) describes how individual learners can extend the amount they learn when they are connected to other more knowledgeable individuals. Thus they form a community of practice. Throughout my practice based PhD I have been undertaking workshops and activities to create prototypes and materials with Art & Design students and staff at undergraduate level. The PhD discusses the work, the prototypes, the findings and the issues arising that help inform the ‘Hybrid Ed-Tech Manifesto’. This manifesto, its examples and frameworks will provide an approach to create dynamic media for new networked education practices. Bret’s concerns are that current software design are a ‘straight jacket’ to thinking. Bret suggests ideas live in representations and through great representations people are enabled to think new ideas. Software is a powerful way to represent information but we are currently limiting this within old paradigms and Bret suggests we now have the ability to enhance these with approaches that are not limited to tactile less screens and rectangles. Bret focuses on inventing on principle and inventing the dynamic medium. We can then break away from simply transposing current limitations of paper and pen to the screen (viewport) and mouse (finger). The following quote from Lev Manovich’s Software takes Command (2013) and his general concepts outlined and approaches support some of the theory within this PhD. I intend to explore this further in due course. Solidify this abstract into aims, methods and outcomes. Read a lot of design manifestos. Get making more things and making them open source. Bainbridge, A. (2014) ‘Digital technology, human world making and the avoidance of learning’, Journal of Learning Development in Higher Education. 2014 edn. Culkin, J. M. (1967) A schoolman’s guide to Marshall McLuhan. Saturday Review. Hannon, J. and Bretag, T. (2010) ‘Negotiating contested discourses of learning technologies in higher education’, Educational Technology and Society, 13(1). Manovich, L. (2013) Software Takes Command. Victor, B. (2014) ‘Seeing Spaces’. Victor, B. (2014) ‘The Utopian UI Architect — re:form — Medium’. ‘Vinay Gupta on Techno-Social Systems, Meditation and Basic Human Needs’ (2015) ‘Vinay Gupta on Techno-Social Systems, Meditation and Basic Human Needs’, 12 May. Watters, A. (2015) Top Ed-Tech Trends of 2015: Indie Ed-Tech, hackeducation.com. Available at: http://hackeducation.com/2015/12/21/trends-indie (Accessed: 10 January 2016). Here are the links to the web version of my newsletter on tech, education and hybrid design. If you like my Periodical please share this page and encourage others to sign up to receive the email.